LEGENDARY Chimurenga music star, Dr Thomas "Mukanya" Mapfumo, has reassured fans that this time around, he will turn up for his homecoming gig. Mukanya last performed in the country almost 14 years ago. Spirited attempts by several promoters and corporates to bring the music icon home over the years have always hit a brick wall. A major attempt to bring the firebrand singer back to his roots was in 2009 following formation of the Unity Government - but that too was unfruitful. This was followed by a Phillip Chiyangwa-organised gig that was supposed to be held at Ochi City in 2012. In 2014, a gig was scheduled to take place in the capital. All the gigs were at some point confirmed by Mukanya's management but the dread locked singer never showed up. Several other unsuccessful attempts were made during the period in question, all to no avail. Now, Dr Mapfumo is slated to perform at the Glamis Arena on April 28 at a gig dubbed "Welcome Back-Big Bira". Naturally, many have, as a result of the artiste's failure to show up, become non-believers. They are not yet convinced the impending return will come to fruition given the previous trend. But speaking exclusively to The Sunday Mail Society last week, Mukanya ardently confirmed his availability for the gig. "Vanhu veZimbabwe ngavasaita doubt yekuuya kwangu (the people of Zimbabwe should not doubt that I'm coming). I can assure you that in April I'm coming there. The preparations are going on well and I'm happy with the way the promoter is working, including every member on my team," he said. "Last week there was a Press conference in Harare, takatumira publicist wedu Blessing Vava, ndofunga mese makamuona (we sent our publicist Blessing Vava, I'm sure you all saw him). This was to show how serious we are in as far as the Bira is concerned." Interestingly, this is the first time Mukanya and his team have participated, let alone hold a Press conference for an impending gig in Zimbabwe. The musician's personal confirmation to this publication was an addition to an earlier video drop. Mukanya relocated to the United States of America at the turn of the millennium. He came back some three or so years later and held a sold out show at Boka Tobacco Auction Floors. He would sometimes visit during the festive season, before abruptly stopping in 2004. He never made the journey back home, even after playing in neighbouring countries like Botswana, South Africa and Mozambique. Eyebrows were raised when Mapfumo's mother passed away in 2008 and he failed to pitch up for the funeral, burial or memorial service. For long, the general sentiment had been that Mapfumo would not come back into the country as he feared for his life because of the politically charged messages in his music. Some suggest that he faces arrest for allegedly buying stolen luxury vehicles. The country is currently under a new political dispensation which is, however, led by Zanu-PF, a party that the singer has fiercely criticised over the years and claim to be scared of. However, Mukanya said he only had issues with former President Robert Mugabe. "The reason why I left the country was based on my security that time. I got a tip-off from my friends who were within the security establishment that my life was in danger. I did not think twice, I had to spare my life that is why I came here. They (President Mugabe led Government) were not happy with my music and I was declared an enemy of the state," revealed Mukanya. "…many statements were being circulated to portray me as a thief, the truth is I did not steal those cars, I'm not a thief. I lost a lot of money when I bought those cars and I'm trying to recover my money back. How can I be accused of stealing cars when the seller was not arrested and is still operating his business in Zimbabwe, does that make sense? This issue had nothing to do with the cars, I gathered it was politically motivated to muzzle my voice because I was very critical of the previous regime." The speculation is not limited on reasons for his prolonged absence, it extends to the singer's private life. 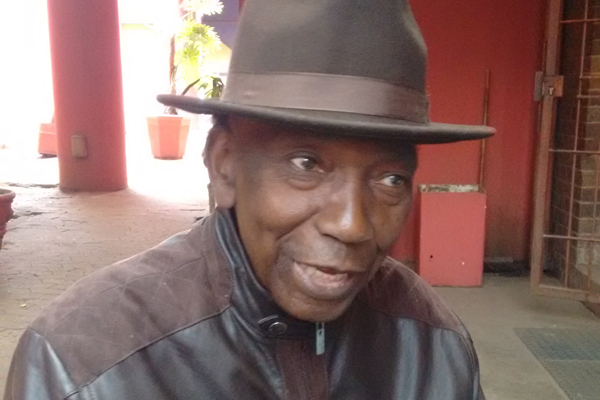 For instance, there were rumours that Dr Mapfumo shaved his dreadlocks sometime back because of cancer treatment. It is said he later stitched them back. Others suggest that he separated with his wife Verna long back. Mukanya cleared the air: "I shaved them (dreadlocks) and grew new ones, that had nothing to do with any health issue. Ndine vhudzi rinokura handiite re-attach (my hair grows fast I do not have to re-attach). Randakagerwa ririmo mumba adzimai vangu vakarichengeta (the locks I shaved off are there in the house, my wife has kept them). I shaved because I wanted a different look, when we were growing up we shaved using a razor and we would leave a patch with long hair. "My wife never came back to Zimbabwe we are still together, happily living tese as husband and wife, izvozvi kutaura kuno vaenda kubasa (as we speak she has gone to work). We are coming back together in April, she has not set foot in Zimbabwe in the last 14 years and she equally misses her mother," said the revered musician. The veteran singer also spoke about his family, commenting on their musical exploits. "I have two daughters, Chiedza and Mati, who featured on my album 'DangerZone'. One of them is now based in Canada, although she is still a key member of Chimurenga Music Company. She was also very key in negotiating with some promoters, who also wanted to host us for the Zimbabwe concert. I also have a son - Tapfumaneyi - who wants us to do a song together, although he likes hip-hop. Plans are there and we will certainly do a collabo." Meanwhile, Mukanya says he will unite old and new band members when he performs at the "Welcome Back-Big Bira." "I'm looking forward to be back in Zimbabwe to reconnect with my roots. America is not my home, home is where the heart is and my heart will forever be in Zimbabwe. I want to make this gig a special moment thus I'm bringing along with me a full band of the guys I left with 14 years ago, and we will also have my old band members who are still there (Zimbabwe)." Dr Mapfumo is currently in the studio recording an album that he intends to finalise before his homecoming show. The project is expected to carry at least eight tracks. Some of the singer's popular but controversial tracks include "Corruption", "Mamvemve", "Moto Uyo", "Mukoma J", "Vanoita Sevanokudai", "Pidigori", "Vechidiki", "Disaster", "Magobo" and "Kuvarira Mukati".